Deadlock Technologies are pleased to provide you with schematics for heavy-duty Crating Machines, with three tiers of research required to fully utilise them. You may now pack ores, plates and other products into crates and then transport them on normal belts. Some infrastructure development on your part may be required to reap the full benefit. And bring power. _Maximum_ power. Each tier of crating machine can handle one fully compressed yellow, red and blue belt of raw product respectively. Belt throughput for crated items is boosted by 10x for ores, 20x for plates, and 40x for small items (i.e. depending on the raw resource's stack size), saving you space, materials and CPU time. Don't like crates and just want raw compression? You lazy monkey. Try the incredible Deadlock Technologies Stacking Beltbox. Modders: inter-mod support is provided so you can crate up your own mod's items easily. See the readme file inside the zip. Maintained and updated by shanemadden. Original mod and possibly future graphics work by Deadlock989. Vanilla wooden chests have been repurposed as reusable crates, using up some of your log mountain. Only raw resources and some intermediate products can be packed into crates (unless another mod enabled more). Filtering will be required at the unpacking end to stop crates getting into your main production lines. You will also need a reverse line on the bus to redistribute empty crates. Crating machines have a high constant power drain, so make sure you scale your crating facilities according to need. Packed crates don't have a higher density of resource in inventories, e.g. chests, trains. You may find crating up ores unnecessary if you move most of it around by train. Main buses of metal plates and intermediates, however, will gain a huge boost once you have the necessary supporting infrastructure. Loaders are recommended, but not required: you can make this work optimally with just inserters. Balancing rationale and some maths plus FAQ on the mod portal. Changelog in-game, see mod list. Last edited by Deadlock989 on Fri Apr 12, 2019 2:38 pm, edited 18 times in total. Updated. Now with 3 tiers of machine scaled to each tier of belt and changes to balance. - An easy way for modders to make their items crateable has been provided. See the readme pdf inside the zip. - Research costs realigned with vanilla technologies. - Research tiers (i.e. which resources are in which tier) now match Deadlock's Stacking Beltboxes. - Research tiers always shown correctly on the technology list. I tried inserting a speed 8 module into the crating machine 3. It through a notice that I can only insert speed module 8 into a crating machine 3. Any thought? Crating machines only accept efficiency modules. If you're talking about some other mod which has a machine that takes 3 full blue belts of input and produces 5 full belts out of output, then, yes. Crating machines can handle one full belt of the same tier. oh yes i understand. See i been tinkering with idea of using crating/pelleting mods because achieving max throughput on some assemblers from bobs an angels takes large amount of goods to be moved. 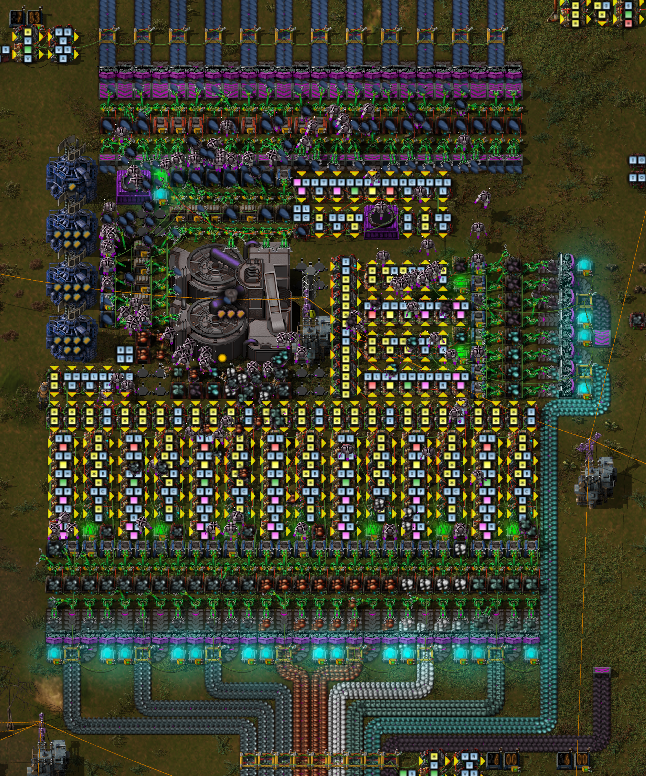 I need 12 full purple belts just to supply 1 ore sorting assembler from angels and 9 belts for the output. Bots handle the problem of having too many belts to a tiny machine but I still am stuck with a fat bus. Looking at 72 lanes of ore being moved to be sorted. That is less than a quarter of how much i need moved over the belts (or trains if I am to separate everything). 12 purple belts? That mod provides a machine which can handle 60 yellow belts of input? Christ on a bike. Possible, yes. Will I do it? Probably not. My gut feeling is that if there are these giant megamods which provide like 27 tiers of progressively more and more uber machines and like crazy levels of module upgrades, they should be looking at providing stacking/crating/compression themselves. I made these mods for my own play style, which is with a small handful of quality of life mods and nothing else. You've seen my other belt compression mod? Crating up stacks or stacking up crates, decisions, decisions. And no, no stack sizes of 1, it screws things up, see the explanation on the mod portal. I wrote this mod because I wasn't satisfied with the various pallet and crate mods. One of them even lets you crate up crates. Crateception. I don't know what to suggest to be honest. I disabled speed modules because it screws with the maths of having the machine be constantly active to cope with one fully compressed belt. If you had speed modules back again, would it even help? Speed 8 gives you what, 250%? I see, then would be more efficient to just add an option in mod option ui to allow speed modules or not. Would this be possible? Btw I love how your crating design looks, I was thinking of using universal palleting in some areas but yours look way more elegent. doc776@gmail.com wrote: I see, then would be more efficient to just add an option in mod option ui to allow speed modules or not. Would this be possible? I will look at enabling speed modules when I can, got a busy week. Deadlock989 wrote: I will look at enabling speed modules when I can, got a busy week. I experimented with this but sorry, decided not to do it. It messes with the balance I worked out for the vanilla game. I don't want to change that just because there are mods out there which have enormous super-fast machines. If there is some huge machine from another mod that produces the same kind of output as 50 vanilla assemblers, then you'll need 50 crating machines to cope with it. - If a technology already specifies unlock effects for a stacked item, those effects are replaced instead of duplicated. - Items from other mods which only specify layered icons are now handled automatically. I have your stacker and crating mods installed. With both installed wouldn't it make sense to crate up stacks of items? Seems kind of stupid to have a belt with stacked items come in, get split 5 ways, unstacked onto 5 belts and then crated into a single belt of crates. I also had a funny idea but haven't run the numbers on it. When you crate ores you need an extra wooden chest. Then at the smelter you uncrate the ore and have a stupid empty wooden chest to deal with. But what if you use the crate as fuel for the furnace? Is a wooden box enough to smelt 50 iron ore? mrvn wrote: I have your stacker and crating mods installed. With both installed wouldn't it make sense to crate up stacks of items? Seems kind of stupid to have a belt with stacked items come in, get split 5 ways, unstacked onto 5 belts and then crated into a single belt of crates. This was my first mod. I had no plans to make the stacking mod when I wrote this. I don't understand why you would want to stack things first and then unstack them and then crate them, it does indeed seem "kind of stupid". Suggested workaround: don't do it. I might look at adding "crateable stacks" but to be honest, the feedback I've been getting is that boxing/crating/palleting is deeply unpopular and people much prefer the crateless stacking beltboxes and the download numbers seem to support that conclusion. No, not even remotely close to being enough. The idea with this and every other boxing/crating/palleting mod is that you return the "stupid" empties back along the bus to where they're needed. See the FAQ and the maths on the mod portal. A box of iron plates is rather big and needs many many belts input to fill an output belt. So the idea would be to have smelter setups that output belts of plates. Combine 5 of them to fill a belt with stacks of plates. Those can then be brought to the crater, reducing the required belts by a factor of 5. In case you misunderstood I'm talking about the crate machine taking a wooden crate, stacks of iron plates and producing a crate of iron plates. I'm not talking about producing a crate of iron plate stacks. This would be just to reduce the number of items that inserters need to load and belts need to move to produce a crate. mrvn wrote: A box of iron plates is rather big and needs many many belts input to fill an output belt. Yes. That's the point. In my current factory I have 16 smelter set-ups each producing a blue belt of iron plates each and another 16 for copper. In total, they don't even fill one blue belt of crates each (you would need 20 belts of input). Each "unit" of smelters outputs to a crating machine. The output from the crating machine is then merged with a priority splitter into the "bus" of crated plates, which is just one belt going forwards with full crates and one belt going backwards with empty ones. All of this is a lot more efficient since priority splitters were introduced. This is all working as intended. Likesay, I will think about making a process for stacks > crates but it's not high priority for me. Can you take a look why crating mod dislikes registering thorium ore from MadClown01's Thorium, Plutonium & Thermonuclear Munitions ? It might be the same for crating but this one goes first in order so it fails first. There might be something peculiar with that icon so autogenerate fails on it. orzelek wrote: Can you take a look why crating mod dislikes registering thorium ore from MadClown01's Thorium, Plutonium & Thermonuclear Munitions ? It looks like that mod is doing some sort of conditional setting up of thorium ore if it can't detect it as being installed already (by Bob's?) Not sure what it's trying to do, to be honest. It doesn't explain why the item is getting through the checks but then not loading. Can you post your code and your info.json? Last edited by Deadlock989 on Wed Feb 28, 2018 9:53 pm, edited 1 time in total. item is name, item is tech level to add it to. It's strange that this check would pass but item got broken. One thing might be that I don't enable thorium in bob's mods and I let Clown's mod to add it. I have full set of bob's, angels and clowns I think.